Ernie Fletcher was a fighter pilot in the Air Force, then became a doctor and a Baptist minister before going into politics. 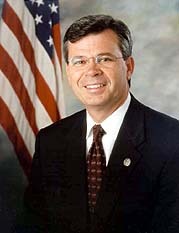 In the mid-1990s, Fletcher served one term in the Kentucky state legislature, and in 1999 he was elected to the US House of Representatives, where he served two terms. In Congress, he voted against allowing needle exchange programs to slow the spread of AIDS, and against allowing medical marijuana for cancer patients. He voted for having the military patrol the US/Mexican border to battle the influx of drugs and illegal immigrants, and for the 2003 war in Iraq. As Governor, Fletcher has favored state funding for construction of a sports arena in Louisville, and signed an executive order removing gays and lesbians from protection against job discrimination. He has also feuded with the Kentucky Academy of Science, arguing that "intelligent design" should be taught in the state's science classrooms. In 2004, while flying to Washington DC to attend a memorial service for Ronald Reagan, Fletcher's chartered jet violated standard flight restrictions for the nation's capital, causing widespread evacuations of government buildings, including Congress. Homeland Security had actually given Fletcher's plane advance permission to violate the ordinary flight rules, but in a communications glitch, the people who needed to be notified never were. Since the spring of 2005, Fletcher's office has been embroiled in scandal, as the state Attorney General -- a Democrat -- has investigated allegations that rank-and-file state jobs were being filled by political cronies, instead of hiring based on merit as state law requires. A growing number of current and former members of Fletcher's administration have been indicted, most on misdemeanor violations of the Merit System law, then subsequently pardoned by Governor Fletcher before trial. In May 2006, Fletcher himself was indicted, but the Governor maintains that any violations of the Merit System law were the result of overzealous underlings, and that the controversy is largely fueled by the Attorney General's political ambitions. Fletcher has said that he will not pardon himself. He ran for re-election in 2007, but lost to Democratic candidate Steve Beshear.